Directional signage for events is very important. Attendees need to know where to go and if they are in the right location. When dealing with event venues like the Buckhead Theatre which frequently has events, signage is even more important. 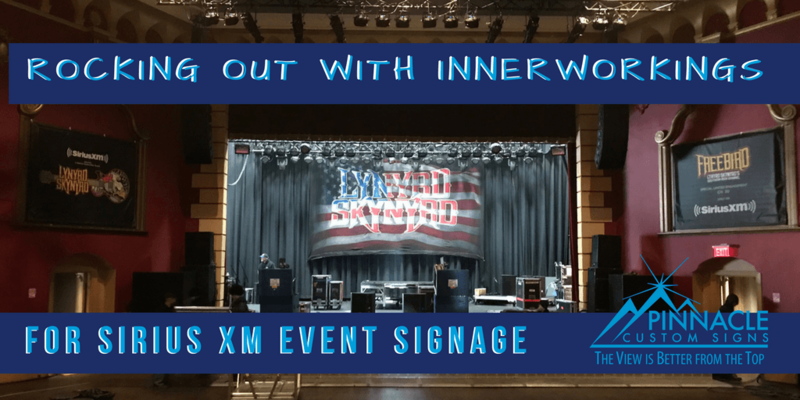 On Thursday, March 15, 2018, Lynyrd Skynyrd performed a special, invitation-only show for SiriusXM at the Buckhead Theatre in Atlanta. 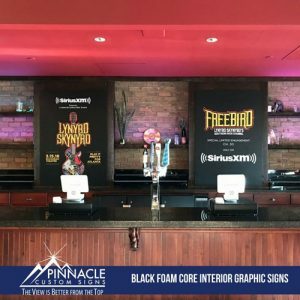 The concert was in conjunction with the launch of the “Free Bird” channel on SiriusXM earlier in the month, which showcased Lynyrd Skynyrd music and exclusive stories and insights about the band. This special event is an epic occasion for fans of the band. It also gave us a unique opportunity to provide valuable services to InnerWorkings, the company that assists in managing the branding and promotions for SiriusXM events. InnerWorkings specializes in marketing efforts for several large entities, providing “revolutionary marketing execution services for revolutionary brands”. One of those services is event marketing and promotions marketing. We have had the pleasure of working with Innerworkings for several installations of their promotion and signage services for brands throughout the Southeast. For this event we were able to provide sign production services as well as installation services. This opportunity to work in Innerworkings was a bit different than our previous work for the company. Usually, we are contacted to bid on the installation for Innerworkings projects. On this job, they were requesting that Pinnacle do the installation and production for the project. 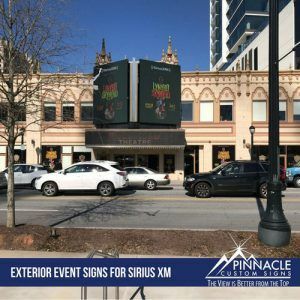 Our team went on-site to the Buckhead Theatre on March 2nd to conduct a site survey for measurements of all the areas where signage installations would need to occur. Because this job included multiple types of graphic signage, our team needed to be sure we had the correct measurements and installation methods to quote pricing up front. We were notified that our quote was accepted on March 8th, a week prior to the concert. We immediately started communicating with InnerWorkings to get the final product finalized, produced and ready for the show. We were responsible for producing and installing the event graphics and banners for both the interior and exterior signs for the event. This was the first time that we had produced signage for the client who normally ships us their completed products for installation. Because this is the first time that InnerWorkings entrusted the sign production to us, we wanted to exceed their expectations so that we could add this service to future projects with them. Because of the added step in what we were doing for Innerworkings, we had several conversations about recommended materials with the client. We worked to utilize their artwork and create pdf proofs to send to Innerworkings for approval. After ensuring all the details on the proofs were approved, we were able to move from production into the installation process for the upcoming show. Because venues like the Buckhead Theatre host events on a nightly basis, the timeframe for installation and breakdown were very small. Our team had to make sure that we arrived on site early on the morning of the event to have everything installed. Our team arrived at the venue at 8am on the morning of the event to install the signage. This included the two vinyl graphics for the display boxes outside of the building; three foam core signs and two event banners for inside the venue. Get Help Promoting Your Event or Business! Many national branding, marketing, and event management agencies benefit from working with business partners in local areas. 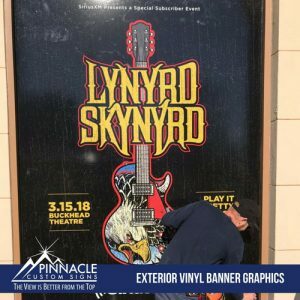 The business partners, like Pinnacle, assist with on-site logistics, like surveying and installing signage for events or new businesses. These local partners have detailed knowledge about the area, including the local rules and regulations, and often provide a specialized set of skills. While we are a full-service sign company, we are always happy to partner with companies to assist in any aspect of their signage needs. For any questions about event signage or signage installation services, give us a call!